Mary J. Blige is a timeless artist with more hits under belt than a Major League slugger. This extremely awesome lady has been out of the musical limelight for awhile now. Nevertheless, she is back and better than ever with a new music, a documentary, and a new album (the latter two of which are named), “The London Sessions!” Kontrol Magazine was privileged to attend a screening for the documentary, which has been met with rave reviews. Never before have people seen this amazing star so vulnerable or truly seen what it takes for her to deliver the quality she and her fans enjoy. Mary admits she felt as if she was becoming stagnant in her msic in recent years. Not wanting to glide on the sheer loyalty of her fans she opted to record and live in London for a month naming the album and the documentary for her experiences there. Mary J. Blige is a timeless artist with more hits under belt than a Major League slugger. This extremely awesome lady has been out of the musical limelight for awhile now. Nevertheless, she is back and better than ever with a new music, a documentary, and a new album (the latter two of which are named), “The London Sessions!” Kontrol Magazine was privileged to attend a screening for the documentary, which has been met with rave reviews. Never before have people seen this amazing star so vulnerable or truly seen what it takes for her to deliver the quality she and her fans enjoy. Mary admits she felt as if she was becoming stagnant in her music in recent years. Not wanting to glide on the sheer loyalty of her fans she opted to record and live in London for a month naming the album and the documentary for her experiences there. “The London Sessions,” may prove to be Mary’s most eclectic album to date. While in London she even worked with producers and artist there. One such artist being, Sam Smith. The hybridization of their style and with her own should prove to be a truly beautiful mix! Then again, she always delivers there is no reason to doubt her now! Mary is slated to perform at the upcoming American Music Awards. Will we be hearing a new single, or seeing a collaboration with Sam? Mary was recently a recipient of Atlanta’s prestigious, “Phoenix Award.” This award is the highest honor an individual, or group, can receive from the Mayor of Atlanta. It recognizes major accomplishments and services rendered to the city, state, nation or world! Other recent Phoenix Award recipients include Nobel Peace Prize winner Muhammad Yunnus; former heavyweight boxer and champion Evander Holyfield, Tyler Perry, WSB-TV Channel 2 journalist Monica Pearson (formerly Kaufman) and TBS Chairman and CEO, Philip Kent. As you can see Mary is in good company. With so much going on for her right now, one has to wonder what is next for Ms. Blige. All we know is she has not reached her peak and The London Sessions should be apart of your musical library on Monday, November 24th! 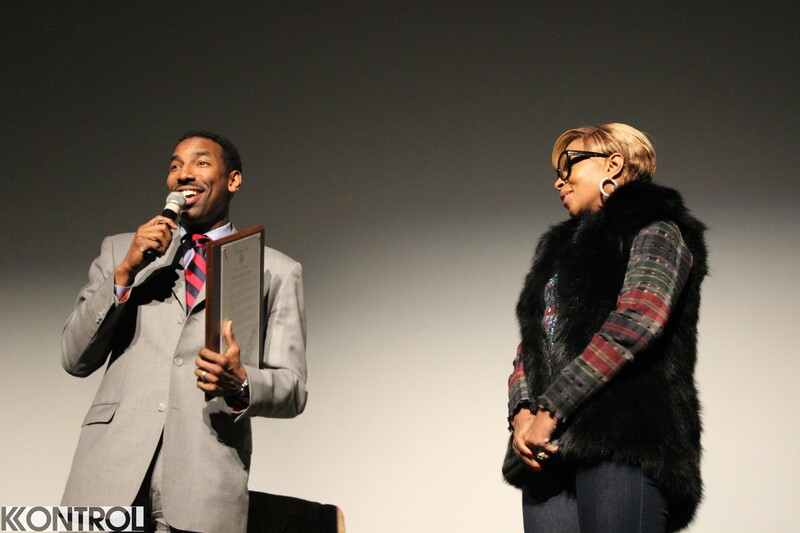 Click the video links to hear more of Mary J. Blige’s amazing interview following the screening of her documentary!